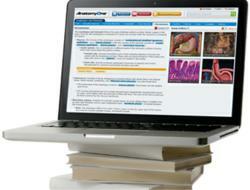 Medical students preview AnatomyOne, the first online resource to combine all the resources needed to master anatomy. AnatomyOne combines the anatomic wisdom of yesterday and merges it with tomorrow's technology. Amirsys® today delivered a preview of AnatomyOne to medical students at the AMSA annual meeting in Houston, Texas. AnatomyOne is the first online resource to combine all the resources students need to master anatomy. AnatomyOne provides a comprehensive, integrated learning experience designed to help students grasp concepts more quickly, understand relationships between body structures, and save valuable study time. “Technology has changed the way students learn, but traditional anatomy products haven’t caught up,” says Dr. David Morton, the Editor-in-Chief and a guiding visionary for AnatomyOne. “AnatomyOne combines the anatomic wisdom of yesterday and merges it with tomorrow's technology." Traditionally, students studying gross anatomy move back and forth between several different resources: a core text, one or two atlases, flashcards, a dissection guide, and review materials. This process is not only time-consuming, but it is a costly challenge for students who struggle to understand relationships between anatomic structures. AnatomyOne overcomes this challenge, integrating multiple text perspectives, atlases, a dissection guide, and assessments into one seamless experience. The new online resource includes regional, systemic, and clinical perspectives; illustrative, photographic, radiologic, and histology atlases; a glossary; a dissection guide; flash cards; customizable assessments; and USMLE-style questions. AnatomyOne is scheduled to release in June, 2012 in time for medical students entering school this summer. Amirsys, Inc. is a leading provider of innovative online healthcare solutions in medical education, radiology, pathology, and surgery. Over 99% of North American academic medical centers use Amirsys products daily. Through use of its proprietary technology and image-intensive, expert and evidence-based content, Amirsys provides online problem-solving solutions to thousands of radiologists, pathologists, surgeons, and residents-in-training worldwide.